NEW YORK CITY, NEW YORK (ANS – Oct. 24, 2018) — Dr. Rick Sacra, a long-term medical missionary and family physician serving in Liberia, West Africa, has won the African Mission Healthcare (AMH) 2018 Gerson L’Chaim Prize. Dr. Rick Sacra, Ebola virus survivor, will use the $500,000 award to train health workers and improve hospital infrastructure at ELWA Hospital in Liberia. 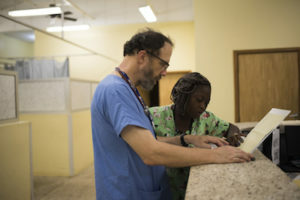 In 2014, at the height of the Ebola epidemic, Dr. Rick Sacra, serving with the mission SIM, voluntarily returned from furlough in Massachusetts to assist his colleagues at ELWA Hospital (Eternal Love Winning Africa) in the capital city of Monrovia, Liberia. As others cared for victims in the Ebola Treatment Unit, Dr. Sacra ran the rest of the hospital. While delivering a baby to a sick mother, Dr. Sacra contracted Ebola. Evacuated to a special facility in Nebraska, thankfully he survived and decided to return to Liberia to help the country rebuild. This is not the Sacras first return to Liberia after challenging circumstances. 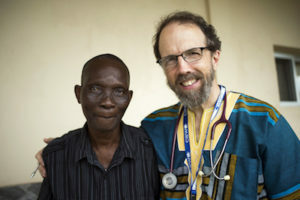 Dr. Sacra has served in Liberia for over 20 years. When civil war drove many Liberian refugees into neighboring Ivory Coast, Dr. Sacra, his wife Debbie, and their children moved to a remote region to serve the refugees. The Sacras then moved back to Liberia when the war ended. ** Train Liberian family medicine residents. Liberia has only one doctor for every 15,000 people, and most of those lack advanced training. ** Install solar power capacity. The nation’s grid power is not reliable, causing the hospital to use precious resources on fuel for the back-up generator. ** Establish intensive care units with trained staff. At present, there is no reliable place in Liberia to send expectant mothers with very high blood pressure, trauma patients, sick newborns or other patients requiring more advanced care. 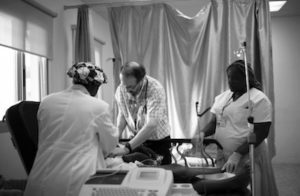 Dr. Sacra is also the beneficiary of a matching challenge grant collaboration between African Mission Healthcare and Christian Broadcasting Network, which is providing $2 million to eight mission teaching hospitals in Africa to expand care, training, and infrastructure. At ELWA, AMH-CBN funds are also being used to support the family physician training program. African Mission Healthcare (AMH) strengthens African mission hospitals to aid those in greatest need. AMH assists its partner hospitals with infrastructure, medical equipment, training, medications, surgery sponsorship, and logistical coordination. Since 2010, AMH has worked with 40 facilities in 16 countries and has distributed $20 million. These efforts have provided vital medical equipment and infrastructure while making possible over 550,000 patient visits, 11,500 surgeries, 115 healthcare scholarships, and training of 2,400 HIV care providers. The Gerson L’Chaim (“To Life”) Prize for Outstanding Christian Medical Mission Service is the world’s largest philanthropic prize dedicated to direct patient care. Made possible by the generosity of Rabbi Erica and Mark Gerson of New York City, the L’Chaim Prize is an annual $500,000 award selected by a panel of leaders in African medicine. The L’Chaim Prize award dinner will be held Thursday, January 31, 2019 in New York. Learn more about AMH at www.amhf.us , visit the L’Chaim Prize page, or write info@amhf.us.